In a recent blog I’ve mentioned DYO pizza when I wrote about making a tomato sauce, but I didn’t go into the joys of making your own pizza bases. These gloomy winter days are perfect for pizza, so I’m suggesting you spread an invite for an (almost) impromtu party. Tell your friends to pop in and bring their favourite pizza toppings and grated cheese and maybe a bottle of something or two. You’re providing the bases and a slow-cooked tomato paste. If you feel flush you could supply a variety of extras. Read on and find out a bit more about the background of the famous flat breat and, of course, the recipes you need to get the pizza party going. Pizza is a basic flat bread with a savoury topping. We know from archaeological research that bread has been made and eaten for around 8000 years, and flat bread with a thin topping has been eaten in southern Italy since Roman times. Pizza Margherita is said to be the queen of pizzas, named after Queen Margherita of Savoy, who visited in Naples in 1889. The queen wanted to try a local speciality and was served a flatbread with a topping of green, white and red – the colours of the Italian flag. The topping was basil, mozzarella cheese and tomatoes. The queen liked it and was thrilled when she heard that the pizza was going to be named after her. In Naples, another pizza speciality was invented – the calzone, which literally means trouser leg. It's a pizza that has the topping spread over half the base, and then the other half of the base is flipped over the topping, firmly closed and then baked. Many other regions combine bread or pastry with a topping/filling: The French have pissaladiere with a topping of garlic, onions, olives and anchovies. The Germans have Zwiebelkuchen (onion tart). The Swiss have the Wähe, a quiche/pizza thingy with a high edge so the topping doesn't roll off. They fill this speciality with lots of veggies and cheese. In Turkey, a flat bread with mince, onions and oriental spices is a popular street food. Flat breads with topping are also eaten in India, southern Mediterranean countries, such as Tunisia, Morocco and Lebanon and, of course, in New Zealand – Welsh rarebits or good old cheese on toast is nothing but a pizza made easy. Around the globe, pizzas are offered in chain restaurants, such as Pizza Hut or Domino's, but they usually have far too many toppings and sweet sauces for my liking. They also taste the same everywhere and have altogether not much in common with the regional specialities of a thin, crunchy base thinly topped with what's fresh at hand. There are dozens of ways of making pizza, but the basics of a bread base and savoury topping are always the same. Put flour into a large bowl, mix with salt and yeast. Pour water on the flour mix – a little at a time – and stir with a wooden spoon. Mix until it becomes too difficult for the spoon. If your dough becomes too wet, add a little flour. 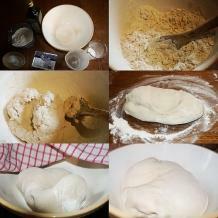 If it’s too dry, wet your hands with water and continue kneading until finally th dough is smooth and elastic. The surface should be neat and silky. This can take several minutes. Feel free to knead on the bench or a table. Take dough out of the mixing bowl, then grease the bowl with a little oil. Put dough back and cover bowl with a damp tea towel. Leave to rise until much bigger in size. This can take a while – depending on temperature, so I suggest you just forget about it for a while. You can’t do anything wrong here because yeast dough is very forgiving. If you come back and the dough is HUGE and has SPILLED ALL OVER THE BENCH, just scrape it up, punch it with your fist, pull it into a neat ball. Good as new. If you prefer you can make this dough well ahead of time, cover with plastic wrap (or put the whole bowl into a plastic bag) and leave in the fridge for up to 4 days until you need it. On pizza day take the dough out of the fridge so it can get to room temperature. This recipe makes enough dough for at least 5 large or 10 little pizzas. The same dough can be used to bake basic white bread in a loaf tin, or for freeform breads and rolls. If you’ve decided to provide some extras, put small bowls on the table and fill with dried oregano, olives, anchovies, capers, fresh basil leaves, shaved parmesan cheese, chilis, tinned artichokes etc. Put your oven on full blast. When you’re ready, spread a little tomato paste on your base, top with whatever you like, sprinkle with cheese and a little dried oregano and bake for about 5-8 minutes. If your oven has fan bake you can put up to three pizzas in at the same time. To help with transfer from table to oven you might want to use plates. The pizzas don’t have to go on to a baking tray – on their sheets of baking paper they can be placed directly on the oven racks.